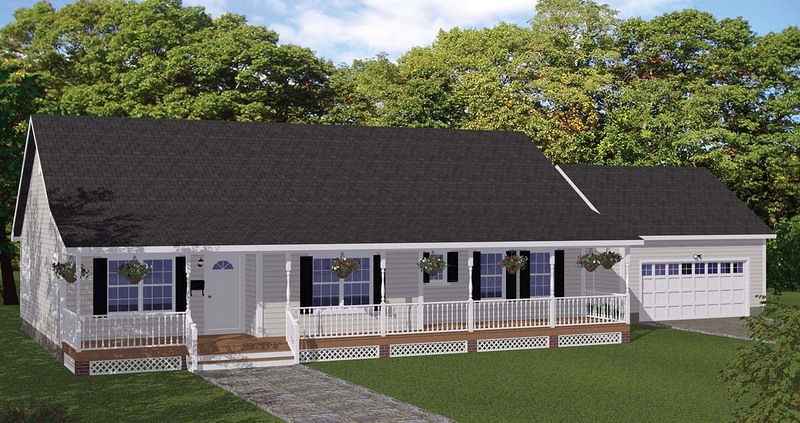 A grand front porch creates an inviting entry to this spacious ranch home while thoughtful design ensures that the home can be built keeping costs manageable. Covered Porch - Turned columns and decorative railing add charm to this covered porch that spans across the main portion of the house. Great Room - A great room indeed. Step from the front entry porch into this gracious living space. It is a wonderfully open area that is bound to be the spot for evenings of family entertainment. Kitchen - Organization will be made easy in this spacious kitchen featuring a large pantry, ample counter-space, and a plethora of cabinet space. The kitchen is also large enough to accommodate a small table and chairs, a place for breakfast or quick snack. Secondary Rooms - Rounding out the home are an additional two bedrooms that have private entrances to a full bath. The home also features a powder room, off the great room for both family and guests, and a utility room housing the washer and dryer that is within close proximity to all bedrooms. Question: Where would the basement be located if preferred it not being located in the middle of the house? Answer: The standard stair location for the basement version of this house is in the place of the closet and powder room near Bedroom #3. Alternately the powder room and closet can be left as they are and an exterior bilco can be used for basement access.